If you’re trying to improve your balance and coordination after stroke, these strengthening rehab exercises can help! You’ll notice that they involve both leg and core exercises. That because balance is a full body activity. So try these 13 physical therapy balance exercises to strengthen your affected side and improve your coordination after stroke! We’ll start with the simplest balance stroke rehabilitation exercises and work our way to the most advanced exercises. Then we’ll share a couple of our favorite tai chi movements at the end, because tai chi helps safely improve balance during stroke recovery. Sit in an upright position with your hands out to your sides. Then, lean to the right side by putting your weight onto your right forearm. Return to center and repeat on the other side, making 10 reps total. If this is too difficult, grab those yoga blocks or books and lean onto them to decrease the distance that you have to move. Do this exercise from a lying position as if you’re getting out of bed. This will put even more weight into your affected side, which will help build balance and coordination. In a comfortable seated position, place your hands on your knees and gently push away, rounding your back and tilting your chin down. This is the ‘cat’ position. Then, reverse the movement by pulling yourself forward and arching your back. This is the ‘cow’ position. Alternate between cat and cow 10 times. Try this in a quadruped position (which simply means on your hands and knees) like the original yoga pose. Do you know what a flamingo looks like when it’s standing on one leg? That’s what you’ll need to look like during this exercise. Practice standing on one leg for about 30 seconds and then switch to the other foot, holding on to a chair, counter top, or table for extra stability. Ditch any assistive furniture and practice this exercise solo. Then, for even more of a challenge, you can continuously increase the duration of your exercise until a 2-minute stand feels like a piece of cake. If you have some mobility in your body, then you might be ready to try some moderately difficult balance exercises for stroke recovery. From a standing position, raise yourself up onto your tiptoes while holding onto the back of a chair or table for support. Hold for 2 seconds, then release. Repeat 10 times. Once you’ve developed some balance and coordination, try doing this without holding onto something. Only attempt this when you’re ready as to avoid a devastating fall, and be sure to have a caregiver nearby. Lie down on the floor with your knees bent at 90 degrees. Then, let you knees fall to the right and stretch your torso. Bring your knees back up and twist to the left. Repeat this core-strengthening balance exercise 16 times (8 on each side). Instead of passively letting your legs fall to the side, use your core muscles to actively move them even farther – without stretching to the point of pain. For an even more advanced move, don’t’ let your feet touch the ground. Instead, hover your legs just inches from the ground for some serious balance-building core work. From a standing position, lift your leg out to your side about 45 degrees (or as much as you can do) and hold it there for a couple seconds. To ensure safety, use furniture to maintain your balance and coordination. Bring your foot back down to the floor and complete 10 repetitions on each leg. For extra difficulty, try closing your eyes during this exercise. It might seem easy in theory, but once you try it you’ll really feel the challenge. Just be extra careful, please! Make sure that there’s someone around to ensure your safety. Sit on a bench (or at the edge of your bed) with your arms at your sides. Then, shift your weight to the right, using you right arm for stability. Then return to center and repeat on your left side. Complete this alternating exercise 10 times. If your mobility is pretty good but you want to work on your core strength, then you’re ready to try some advanced physical therapy balance exercises. Do a typical crunch, but alternate between touching your right elbow to your left knee and then your left elbow to your right knee. Try these crunches on top of an exercise ball for extra range of motion that will make your muscles work harder. A box squat involves sitting down onto a box (or chair) and then standing back up. This is considered a partial squat because you get to rest at the bottom instead of holding your weight in the lowest position. Do 10 reps, or more. Try doing full squats when you’re ready. Be sure to pay extra attention to proper squat form by keeping your back straight to avoid injury. Walk across your kitchen by taking baby steps, using the counter for support. To perform these baby steps, place your right foot firmly on the ground beneath you and then place your left heel right up against your right toes. Your feet should be perfectly in line with one right in front of the other. Then, practice walking while keeping constant heel to toe connection, placing your right heel to left toe and left heel to right toe and so forth. Try this balance and coordination exercise without the counter for support (but only when you’re ready!). For an even greater challenge, you can try it on an uneven surface like a grassy hill or sandy beach. The uneven terrain will make you work harder and improve your balance even more! Try taking 10 steps backwards in your kitchen while holding onto the counter for support. If your kitchen isn’t big enough, so this along a wall in the living room. Make sure that there are no obstacles in the way before you begin the exercise. 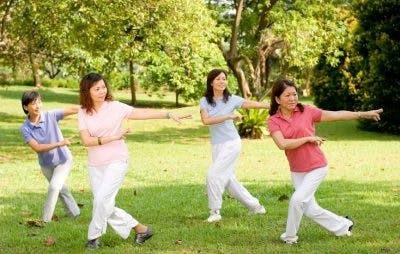 Did you know that tai chi is beneficial for stroke patients who want to improve balance and coordination? The following tai chi exercises were created by our physical therapist, Barbara. You might feel silly in some of the poses, but they’re great for improving balance after stroke. In tai chi, there is a focus on energy and visualization. If you’re not into that – great! Ignore those parts and just do the movements. But if you’re into that sort of thing, enjoy the full experience. Then, visualize yourself carrying that big ball of energy right in front of your torso. While using your arms to carry that ball of energy, pivot your torso to move the ball around in front of you in the shape of an infinity sign (a sideways figure 8). And there you have it! Those are our 13 best balance exercises for stroke patients! We hope you find them useful.